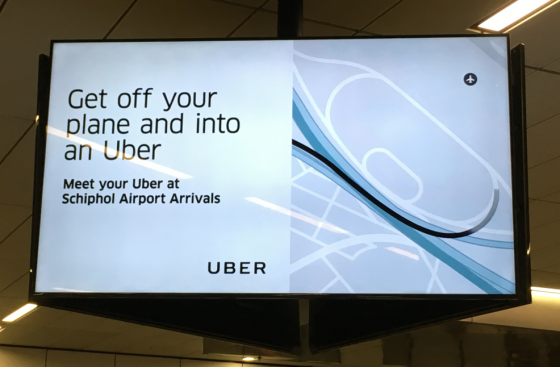 Uber should not be allowed on the roads unless its drivers conform to normal taxi regulation, a Dutch road safety organisation has told the Telegraaf. Drivers working for the online taxi broker have been involved in four road deaths in the past week, and Uber has been in talks with Amsterdam city officials to explain why. Rob Stomphorst, spokesman for Veilig Verkeer Nederland (VVN) reportedly told the Telegraaf that it has serious concerns because the organisation currently operates under fewer controls than conventional taxi firms. ‘They are just kamikaze pilots,’ he reportedly said. ‘There have been four deaths in six weeks and yesterday another accident in Amsterdam where a nine-year-old girl was seriously injured and the driver just rode on. He called the situation ‘outrageous’ and added that Uber – which apparently has lighter regulation – should come under exactly the same rules as other Dutch taxi businesses. Uber has had a troubled regulatory past in the Netherlands. Its Uberpop service, based on unlicenced drivers in their own cars, was banned by a court in 2015, and the firm fined €360,000. The firm had talks with Amsterdam head of transport Sharon Dijksma earlier this week about the recent accidents, and has told DutchNews.nl that it is investing in technology to improve driver safety. It has, it says, a limit on drivers using the app for more than 12 hours straight. But Uber drivers are currently treated as self-employed, and critics say the system encourages them to cruise around late at night in search of fares. The so-called ‘platform’ economy of services brokered through websites is under scrutiny across Europea. Earlier this week, a Dutch court ruled that cyclists delivering take-aways for Deliveroo were not genuinely self-employed and should have the same pay and conditions as normal delivery employees. Courts in France and London have recently judged Uber drivers normal employees. Last month the European Court of Justice ruled that Uber is indeed a transport firm rather than a computer-based ‘intermediation service’, as it had argued. DutchNews.nl has contacted VVN to confirm the quotes in the Telegraaf, and Uber to ask for a response.